Studente di biotecnologie all'Università di Pisa, nato e vissuto a Cagliari fino al 2016. Mancino, da cui il nickname. Whatever your political views may be, chances are you don’t like the European Union. This is not hard to tell, nobody likes the European Union. By this, I mean literally no one: europeanists want a stronger Union, euroscepticists want a weaker one, nationalists think its target is to eradicate national identities, globalists strive for this to happen, populist see a Union which is a friend to banks, liberists say it kills the market with strict regulations. Even within its structure, the only one to advocate the status quo of a union as an international treaty between sovereign states has been Jean-Claude Juncker, with a recent statement during the last year. As common, the European Union as it currently is, is a consequence of compromises and compromises usually make everybody agree on something nobady likes. Hence if this Europe is not good, what makes the right Europe? Is there a model for Europe to satisfy federalist, pan-european and nationalist dreams while being appreciated by the common people who don’t care about politics? Whatever it is, it surely need essential structural reformation, along with a new look, some new marketing. Peoples’ Europe is not made by politics, whether it’s made in a parliament or in the streets. It’s made by the people, the educated and the uneducated. There’s a phenomenon in psychology called cognitive ease, also known as processing fluency, which can be shortly described as the tendency of the minds to like things it recognises. This phenomenon is largely exploited by the advertising industry: when a logo, a jingle, a catchphrase is repeated a sufficient number of times it becomes familiar and so the product, which is therefore sold more easily. For this reason persuading and insistent symbols are needed. and Zeus can be found on coins, statues and they also feature on deviantart artworks (as in the Coat of Arms on the side, by the user Optimus01). These two character are though unknown to most people and an unknown symbol is a useless symbol. It would be possible to dismiss it but as I said they do have a historic usage and there are not so many graphic symbols around. Speaking of which, a coat of arms or an emblem is necessary. Europe has a beautiful flag, it’s iconic and recogniseable but its sqared shape is antiaesthetic when featuring on driving licenses, sponsorships and documents. 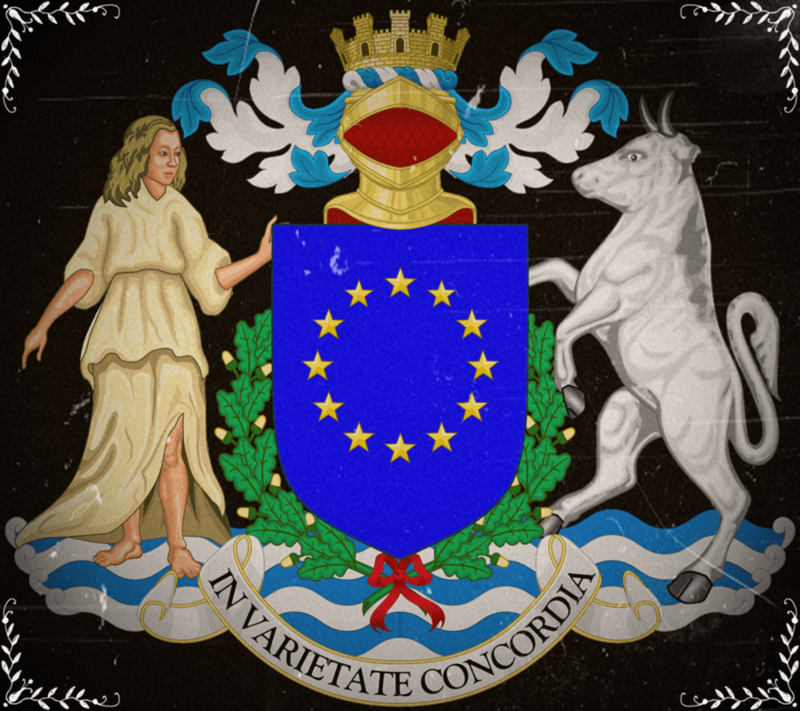 Whether it will be a simple shield like the Slovenian one, some complex escutcheon as with Spain or a non-heraldic emblem like the Italian and French ones, we need a round, compact, pleasant sign. There is a symbol in particular requiring a paragraph of its own. The Ode to joy surely has been a good choice. The melody is artistically remarkable, it’s catchy, it has no copyright, and it’s entirely made in Europe, particularly in Germany. Precisesly because of the accusation of germanocentricism this anthem has its fundamental flow, again because of compromises: it has no lyrics; it’s written, quoting the official site, in the universal language of music. The universal language of music, however, has the central problem that people cannot sing it when it plays, the audience is not involved. This, by the way, can be easily fixed: there are several proposals for latin and esperanto translation of Schiller’s lyrics, therefore lacking any local or nationalistic prerogatives, in addition to the uncountable translations to national languages which have been written since 1785. A muted anthem is not an invention of the EU, but it’s usually adopted by countries whose national identity is put in serious doubt as in Spain and Kosovo. Furthermore, the Spanish national team with their mouths shut while the Marcha Real plays is rather a cringey show to watch. It is hard to find something more European than football. It binds mediterranean Italy to nordic Germany, western France to slavic Poland. Belgium is truly united under the same flag only when it national team is playing, and this can also be applied to Italy. And this also applies to the opposite: the refusal from Scotland share its team with England is a symptome of their radicated quarrel. In summary, we need some rich europeanist with millions to waste to create a blue team with twelve stars and make it play in important leagues. This can also be said for sports that have a smaller audience and, maybe, even to the Olympic Games one day. Now about structural reformation. Whatever your opinions about federalism and United States of Europe are, the Union would have much to gain and possibly nothing to lose from acting as one only entity with foreign affairs. The relations between countries are always confrontations of strength and the sum of the European states is not as strong as one only great Europe with common interests on a strategic, market and diplomacy side. There is an example which would have twisted the mind of every nationalist in Italy. From 2012 to 2016 two marò (marines), Massimiliano Latorre and Salvatore Girone, were held captives in India for the assassination of two fishermen who got mistaken for pirates, creating tension between the two nations. Let’s imagine now what if Italy didn’t have to debate all alone with a country endowed with nuclear weapons. Let’s imagine now that it had twentyseven countries on its side, three of which militarly relevant, half would be part of the Atlantic Treaty and all of them would make the greatest market in the world. Even the threat of an embargo (even if not a realistic threat) would have been sufficient to put those two marò on an airplain heading to Roma Fiumicino. In order to make European foreign policy more convincing, we also need conjoined military force. Not an alliance, as NATO is, but rather one land army, one air force, a mediterranean and an atlantic navy, all of them centrally coordinated. We would need to fill some differences in order to achieve it, do an inventory of all the weaponry, have a referendum about compulsory draft in those countries where it is still in use roll up the continent’s sleeves. This would be a hard job with the great reward of one only army and its consequent international relevance. Rather than a political or marketing move, this one is a necessity. There’s not enough room within this article nor enough competence in its author’s curriculum to suggest any economic policy of any sort. One thing is clear, however, even to those who know little to nothing about economics: sharing our monetary policy while having distinct economic policies has been a bad gamble we have to fix as soon as possible. Nonetheless the Old Continent’s democratic apparatus going against the Troika would be really good advertising, as this is seen by many as the incarnation of evil, of the New World Order and of pineapple on pizza. What natural catastrophies in Italy and terrorist attacks in France and Germany should have taught to us it is than common citizens like to be taken care of in extraordinary situations way more than they like funds in agriculture, customer rights or CETA and TTIP. More publicity of conjoined civil protection during natural and non-natural calamities, along with more news about the collaboration between intelligence agencies would give prestige to the Union. The citizen of the member states elect the president of the European commission and the European Parliament. Any other European institution is not directly elected. This is the most important point and it is maybe what differenciate a national organization from a supranational one. It also is, of course, the hardest to achieve. Overly simplifying, within the European Union legislature is shared between the European Parliament and the Concil of European ministers, while the executive is the European Commission. 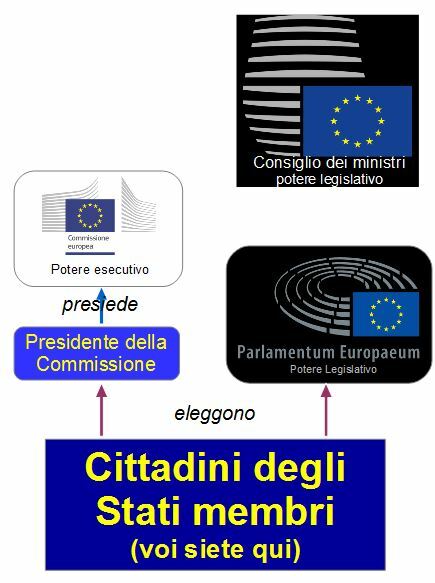 Citizens, every single one relying on their state, elect a given number of Members of the European Parliament and also, as a whole, the president of the European Commission. The members of the Commission are nominated by member states. The Council is nominated by the government of the member states and its composition varies time by time, as it only gathers for specific matters and it is usually the minister responsible for the matter to take part of it (for instance the ministers of finance will gather for economics and balanca issues). It is easy to see why neither europeanists nor euroscepticists are happy with this system, expecially if we compare it to the Italian one. Italian system of government has little representativity but it’s exactly where it is needed. There has been a lot of discussion about this topic in Italy due both to its constitutional referendum and to some misunderstandings about how the election of the Prime Minister works. The only reason italian citizens are required to vote is to elect their Chamber of Deputies and their Senate, not considering local elections. While this may seem too little partecipation in politics, the Parliament is actually the central core of the Italian Republic. The Parliament legitimates all other charges: it elects the President of the Republic, it confirms the government, and, of course, it legislates. In contrast, the European Parliament is kind of a Lower Chamber within the European Union, it must share its power with a non-elected assembly and to rely on the Commission to apply the laws it creates. There is another example of collective executive, and that is the swiss Federal Council. As I said yet in another article (in italian) swiss politics is entirely based on direct democracy, therefore this collective organized government works as it is the real expression of the nation’s will. Some advice from the author and many other europeanists: we need a paneuropean chamber to represent citizens as a collectivity, not based on the country they live in, to flank the European Parliament, and we need the people to have power over the executive. This is a change which would be appreciated not only by those who see potential in the European project, but also by those who have no trust in it, considering the largest eurosceptic parties all belong in the group for Freedom and Direct Democracy. We have a long way to go, but we started walking. Different political efforts, from socialists of the PES to liberalists of the ALDE, are being put intransforming this Europe into a democratic and civil home for its citizens. Translated by Enrico Casu for My Country? Europe. TAGS: Democrazia inglese My Country? Europe.